The answer to the question about the differing presentations of the two formats lies in the foundations of these two document types. HTML files are displayed in accordance to whichever Operating System/Browser you are using. For example, using different web browsers such as Google Chrome or Mozilla Firefox can affect the way an HTML is displayed/presented. This is because the underlying code in the HTML file is communicating with the underlying code in the browser being used, and each browser interprets and displays HTML differently. Additionally, the SEC has its own specific conversion process that dictates how the HTML is presented on the SEC’s website once it is filed. 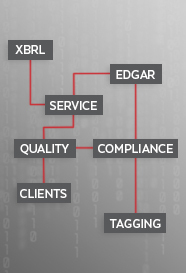 RDG adheres to those SEC standards known as the EDGAR Filer Manual. A PDF file, on the other hand, is not dependent on the Operating System/Browser to dictate how the file is displayed. A PDF is usually not meant to be altered, and it is essentially a snapshot of a document as it would look were it to be physically printed out on 8.5×11 paper. This is why the PDF file type is the preferred method for documents that are meant to be presented to an audience or physically printed out. So the PDF proof can look different than the HTML version because when the HTML’s underlying code is converted into a PDF file, some of the characteristics of the HTML’s code can be stripped out by Adobe PDF’s differing interpretation of that underlying code. That being said, when something doesn’t appear to be presenting correctly in the PDF proof, we strongly advise adjusting the scale/zoom feature in Adobe. The screen on which the PDF is being viewed on can also affect how it is displayed. If you are viewing the PDF on your phone versus viewing it on your computer, then there can be some differences in how it’s displayed. This also applies to larger or smaller computer monitors. Alternatively, if you are viewing it on your screen and something doesn’t look right, you will find that physically printing the document will show that issue is not in the document itself, but rather is just a function of how Adobe presents PDFs on screen. Why are the underlines missing in this table? Usually that is a direct result of the “zoom” or “scaling” feature in Adobe. Solution: Adjust the zoom/scaling in Adobe (zoom in or out) until the underlines appear correctly. You can also print the document to confirm the underlines are present. Alternate Solution: View the PDF on a different sized screen/monitor. If issue still persists, please contact us and we will be happy to assist. Why are the indents incorrect? HTML files can have margins as big or small as necessary to display the information. However PDF files have maximum margin limitations, which can create presentation differences on paragraphs that are fully justified. This is because Adobe is trying to adjust the presentation in a way that fits with its own parameters. Solution: Adjust the zoom in Adobe until the indents appear correctly, or print the document. This can also occur in bulleted lists. The presentation of spacing between bullet points or within bullet points can be inconsistent based on how Adobe PDF interprets the HTML code. If you have any other questions regarding the presentation of a PDF file versus an HTML file, please feel free to contact us and we will be happy to assist.